Imagine yourself sitting on your pergola covered terrace overlooking olive groves and vineyards, savoring your first espresso of the morning and enjoying a pastry from the shop in the town just 5 kilometers away. As you look out onto the countryside, you can see hilltowns in the distant that have been there for hundreds (maybe thousands) of years beckoning you to come and explore. 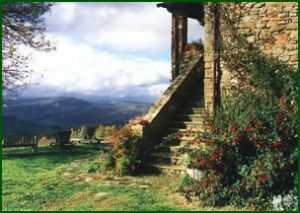 You are in Umbria, the "green heart" of Italy at a restored farmhouse that you will call home for one glorious week. 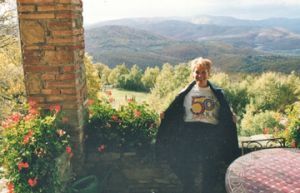 The scene I have just shared with you is an actual experience I had renting a villa in Umbria and the occasion was my 50th birthday celebration. Turning 50 was definitely an event for me and instead of hiding under the covers, I chose to bring in this epic birthday Italian style. I designed this trip with my husband to be one of relaxation, exploration and celebration. It was all that and more. The restored farmhouse was 5 bedrooms / 4 bathrooms, had an ultra modern kitchen and was situated on a hilltop with panoramic views of the Umbrian countryside. We found mountainside restaurants, plenty of hilltowns to explore within an hour's drive, local food markets, and a peaceful setting to just relax, read and be together. The ultimate dream was my birthday dinner celebration. We hired an Italian chef to come to the farmhouse where he prepared a 6+ course meal, taught me how to make ravioli and sang happy birthday to me in Italian. This was definitely the way to celebrate a half century of life. My fifty years seemed so young compared to the thousands of years of depth and history Italy, it's people, culture and countryside represent. Over the past 30 years, I have traveled to Italy for both business and pleasure, each time exploring a new area or learning more depth of a city or region. My husband and I started traveling to Italy initially to visit his sister who had been living and working in Rome. We would stay with her a few days and then head onto another country and sample more of Europe. At the end of our trips we had packed and unpacked at least 4 times and sometimes visited 3 countries. We covered a lot of ground and sampled many things but almost needed another vacation when we returned home. In 1993 we discovered there was a different way to travel and experience Italy and that was by renting a restored farmhouse, villa or apartment for a minimum of a week or more. All of the normal fears came knocking, "Can we drive in Italy? ", "We don't speak Italian", "How will we know what to do once we get to the farmhouse?" and of course, "How can I cook in Italy when I can't read Italian?" The fears diminished once we unpacked our bags (for a whole week) and began to explore the area, small hilltowns and literally immersed ourselves in the culture and countryside. The old adage of, "When in Rome, do as the Romans do" became much clearer. We didn't know the language but were willing to learn a few words that started us in the right direction. We were observant and watched the Italians grocery shopping so we knew that you had to put a coin in the slot to get the grocery cart and when you returned the cart you got your coin back. We often found someone who spoke a little English and we could say hello, good evening, good night, please, thank you and where is the bathroom in Italian. The driving experience was exhilarating to my husband. He was definitely in his element with Italian drivers and soon learned the essential driving tips. Each trip became richer as we learned how to design our Italian adventures. We began by setting our intentions for the kind of trip we wanted, used our experience and references we had developed to research the region and dwelling types and build an itinerary that included the type of activities we hoped to experience. I developed a list of artful questions to ask when selecting a base and property so that we had a better idea of what we were renting and minimized the surprises that can sometimes impact the entire trip. Through a lot of exploration, research, experience and trial and error, we enjoyed renting properties and apartments in 5 different regions within Italy. We have learned how to immerse ourselves in the culture, experience the people, the history, the countryside and the richness of the Italian way of life….La Dolce Vita…the sweet life. If you are drawn to Italian food, wine and olive oil, the warm colors of terra cotta, yellow ochre, burnt umber, love exploring the countryside and strolling through hilltowns and markets, renting in Italy is something you need to explore. I have the ultimate pleasure of working as an Italian Travel Specialist where my passion is supporting clients to take their dreams to reality and to find a vehicle of a different kind to experience the adventure of a lifetime. If you are interested in working with an Italian Travel Specialist, fill out the Consultation Survey Formor e-mail Ginger. Hire an experienced Italian Travel Specialist to support you for a stress free process where even the planning becomes an adventure.